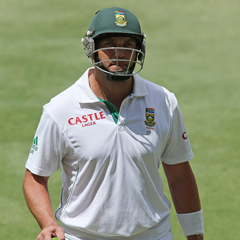 Kallis's grit to inspire SA? Cape Town - Hardly for the first time in his illustrious career, an injury-impeded Jacques Kallis has served as a catalyst for continued South African resolve against the odds in a Test match. The great all-rounder’s half-century in the engrossing second contest against Australia at Adelaide Oval on Saturday wasn’t the premier individual performance of day three statistically, but it was undoubtedly the most courageous. It also went a long way to ensuring, vitally, that the Proteas stay interested in the possibility that they might yet earn a famous victory - albeit that the odds reasonably firmly favour the Baggy Greens and a draw is also still not totally out of the equation. For the bulk of his 17 years at this level, Kallis has been the go-to man in a crisis, especially when it has occurred at the crease. Now aged 37, the trend simply came to the fore yet again. Significantly hampered by his upper hamstring problem that will almost certainly rule him out of the final Test at Perth (a blow of magnitude, that one), Kallis took to the middle in the unfamiliar role of No 9 and with the tourists having receded disastrously at the time from 233 for two to 250 for seven in reply to 550 ... the smell of humiliation was strongly in the air there and then. But his slightly laboured yet still somehow incredibly soothing walk to the middle would also serve as the critical moment in which South Africa stopped their severe damage and began to gnaw their way back into the Test again. Kallis’s very presence a tonic to the revealingly cool-headed and composed debutant Faf du Plessis (78), the pair posted 93 runs in some 30 overs - a purposeful, positive scoring rate when you consider how seldom the more seasoned partner in the alliance was able to run twos, never mind threes. Not surprisingly, Kallis found it easier to deal in boundaries than anything else, and 46 of his 58 runs came that way. Just as characteristically, the big customer’s desire only strengthened as the Aussie bowlers of all varieties shrewdly did everything in their power at first to make him either stretch, weave or duck as often as possible and only aggravate his condition. His innings also inspired flashbacks to his phenomenal, back-to-back centuries (161 and 109 not out) in the final Test of a tight series against India at Newlands in 2010/11 when he played for the most part through excruciating side pain. Again, the South Africans had been wobbling a little in each instance, prior to his taking guard. There was an element of good fortune from an Aussie perspective, too, to Kallis’s eventual dismissal attempting a sweep shot, a review confirming the ball had inconveniently looped up late onto a glove. Had he not exited then, I fancy there would have been a better than even chance of the proven dominator going on to a three-figure score and the Du Plessis partnership possibly even assuming really large proportions. As it is, the Proteas are still having to scoop water from their boat, considering the gruesome “leaks” suffered at the hands of torpedo-in-chief Michael Clarke and company on day one. But with Rory Kleinveldt so pleasingly to the fore with the ball and Dale Steyn cranking up his readings on the speed gun to best series levels yet, the initial Aussie second innings charge has been quite firmly arrested. The host nation are 273 runs to the good, and on a deteriorating track even that may prove to be enough, let’s face it. Yet if the still-fighting South Africans can knock over the remaining five wickets without significant further concession in the runs column, a fairytale win really cannot be discounted by Graeme Smith’s side. Many of their number will still have fond, spirit-aiding memories of that fourth-knock chase-down - easily, too! - of 414 at the WACA four years ago. Bear in mind also that aggressive paceman James Pattinson has a side injury which may preclude his bowling in the Proteas’ second knock, and if the batsmen can play off-spinner Nathan Lyon competently, it is just possible that the Aussies will be pretty short of wicket-takers and suffer a little in the ongoing heat. That good judge of Australian conditions, Kepler Wessels, reckons 330 is about the maximum South Africa might look on with some sense of confidence in a possible victory quest, whilst former coach Eric Simons, in the SuperSport studio back home, made the point that an additional 100 runs by the Baggy Greens could well mean curtains ... that would lift the target to around 375. With a collective infusion of the spirit of JH Kallis, who knows what is possible?